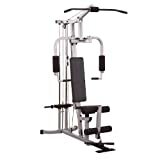 Compact machine offers an incredible total body workout that will fit in virtually any room Designed with versatility, durability, dependability, and affordability in mind Durable steel frame features a long-lasting powder-coated finish Patented press arm system functions as a chest press station in addition to replicating the pectoral dumbbell fly Performs a variety of different exercises, including high pulley, low pulley, leg extension, leg curl, and more Easy selector pin allows you to add standard weight plates when you want to push your limits Optional 150-pound selectorized weight stack available Comes complete with lat bar, straight bar, utility strap, and workout poster Weighs 125 pounds Please note that some assembly is required Manufacturer’s warranty included: see complete details in the Product Guarantee area About Body-Solid Body-Solid has been making high quality strength training and exercise equipment for over 20 years. Designed for today’s workouts, Body-Solid machines feature innovative technology and distinctive styling that suits your home. Body-Solid equipment meets the challenges of today’s busy lifestyle while providing you with the utmost in advanced home exercise. From space-saving designs that suit any room, to full-sized gym systems with every available station, Body-Solid gives you the features you want at a price you can afford. All components of all machines are covered by a lifetime manufacturer’s warranty; something you won’t find from any other manufacturer in the industry. Assembled dimensions: 61L x 38W x 84H inches. Compact machine offers a total body workout. Stations include chest press, pectoral fly, and more. Includes lat bar, straight bar, utility strap, and poster. Selector pin is compatible with standard weight plates. Manufacturer’s warranty included (see product guarantee).